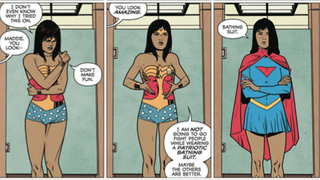 Issue 3 of Patrick Kindlon, Matthew Rosenberg and Josh Hood’s excellent comic series We Can Never Go Home featured a scene where the female hero Madison tried on a bunch of famous superhero costumes to disguise herself—some better than others. One big change for the reprint this week? More outfits for Madison to mock. Can you name all the references on display? Let’s hope these easter eggs make it into the eventual trade paperback intact, otherwise these single issues will become suddenly rather valuable. By the way, if you’re not reading We Can Never Go Home, you should be! It’s a pretty fantastic and engaging tale of teenagers getting powers way beyond their control, and how they react to that when things go horribly wrong. Reprints of the first three ridiculously successful issues are available now, and good news! Issue 4 is out August 26th.